The following closed claim study is based on an actual malpractice claim from TMLT. 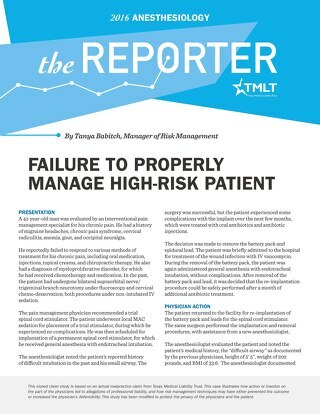 This case illustrates how action or inaction on the part of physicians led to allegations of professional liability, and how risk management techniques may have either prevented the outcome or increased the physician's defensibility. An attempt has been made to make the material less easy to identify. If you recognize your own claim, please be assured it is presented solely to emphasize the issues of the case. A 52-year-old man fell from a tree and fractured his ankle. His family brought him to the emergency department of a local hospital at 8:30 p.m. The on-call orthopedic surgeon evaluated the patient and diagnosed a distal comminuted fracture of the left lateral tibia. The patient was scheduled for surgery the next morning. The records indicate that he had a history of coronary artery disease, prior myocardial infarction (MI), hypothyroidism, and depression. 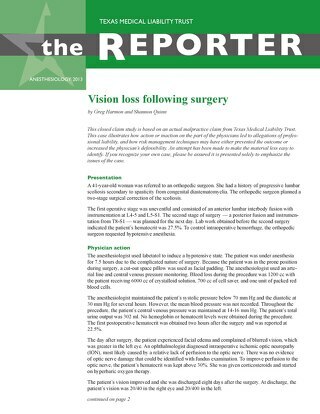 An anesthesiologist performed a preoperative assessment on the patient the next morning. The patient's son, who was a paramedic, was present. During this interview, the anesthesiologist recommended a spinal anesthetic with endotracheal intubation. The patient's son wanted a general anesthetic in conjunction with a laryngeal mask airway (LMA). The anesthesiologist — who was told that the patient had not eaten since before midnight — agreed to this form of anesthesia. The patient had, in fact, eaten a large meal at 11 p.m. and was taking narcotics for pain. The surgery was performed without complication until the anesthesiologist removed the LMA and noted that the patient had vomited. 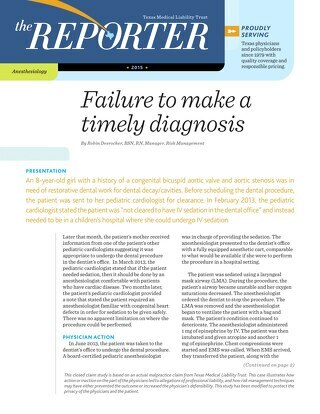 The anesthesiologist estimated that less than 1 cc had been aspirated and called for a pulmonology consult and pulmonary treatments. At 2:14 p.m., eight minutes after arriving in the PACU, the patient vomited coffee ground emesis. A short time later, his oxygen saturations fell from the 70s into the 40s. The respiratory therapist arrived with equipment to intubate and ventilate the patient. The anesthesiologist told her that it was his decision to make and he did not want to intubate the patient. The respiratory therapist later testified that the anesthesiologist "blew her off." At 3:15 p.m., the pulmonologist arrived and recommended that the anesthesiologist intubate the patient immediately. The patient was intubated at 3:17 p.m. and put on a ventilator. The anesthesiologist recorded that the patient had suffered postoperative hypoxemia secondary to aspiration. The patient's family became very angry with the anesthesiologist and had him removed from the case. The pulmonologist took over the care of the patient, who remained in ICU for 32 days with severe ARDS. 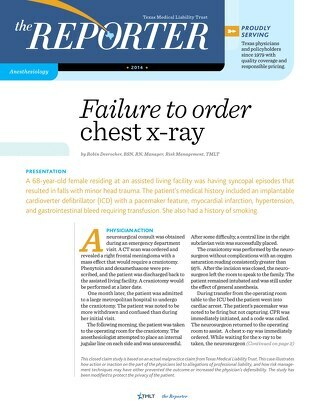 The patient was also treated with medication for GERD while in the ICU. He was discharged to a rehabilitation facility. He progressed slowly during rehabilitation because of atrophy of his legs and foot drop. A neurologist examined the patient and found that he had deficits in short-term memory and impaired speech. The patient was also depressed. An EEG revealed cerebral dysfunction in the left and right frontal temporal areas. 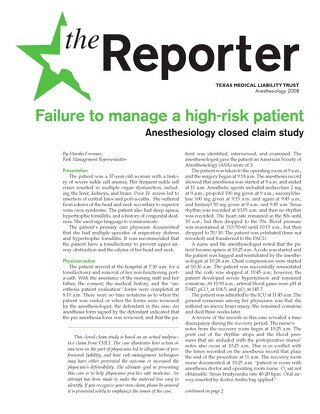 failure to properly document care of the patient and the risks associated with the anesthesia technique. The patient claimed total disability due to the foot drop and is unable to work. The defense was unable to locate an expert supportive of the defendant's actions. 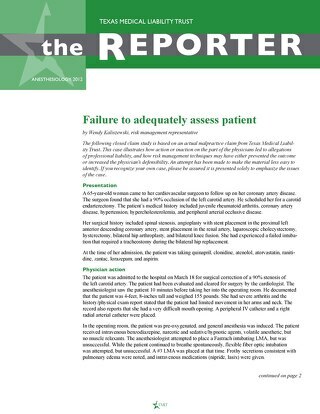 Overall, the anesthesiologists reviewing this case were critical of the delay in recognizing a significant aspiration event when the patient was in the PACU. When the patient vomited in the PACU, his oxygen saturations decreased for an extended period indicating possible ARDS. The reviewers felt that the anesthesiologist should have immediately intubated the patient and called for a pulmonology consult with bronchoscopy. 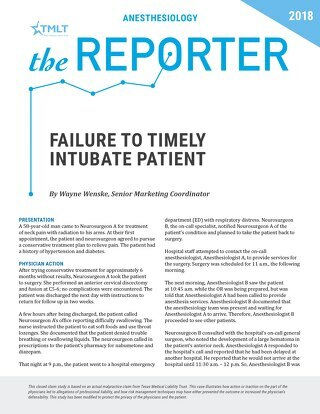 The respiratory therapist was also very critical of the delay in intubation. Reviewers were also critical of the decision to use LMA in a patient with a history of GERD and MI. 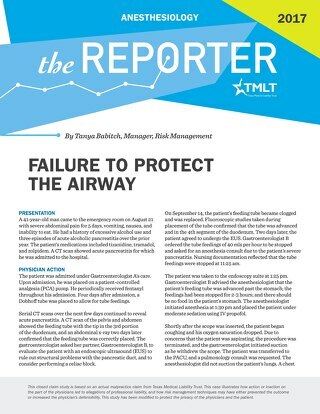 The patient had a 'history that dictated protection of the airway.' However, it is unclear whether or not the family told the anesthesiologist that the patient had been treated for gastric reflux disease and UGI obstruction. 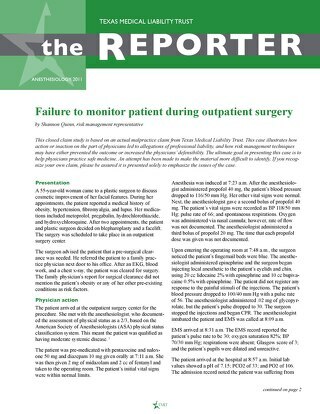 Additionally, the anesthesiologist was not informed that the patient consumed a large meal at 11 p.m. while taking narcotics, which can delay gastric emptying. The defense was able to develop significant arguments concerning causation and damages. During his deposition, the patient did not present himself as someone who has suffered a significant hypoxic injury. He answered all the questions but was very slow to speak and think. His primary complaints were associated with a foot drop. While the plaintiff's neurology and neuropsychological experts believed the patient sustained anoxic brain damage, a neurologist who treated the patient following the incident had a different opinion. He agreed that the patient has cognitive impairments and memory deficits, but does not think the patient has neurological deficits. It is his opinion that the patient is depressed and is unable to deal with his life-changing injury. (The patient was treated for depression prior to this incident). 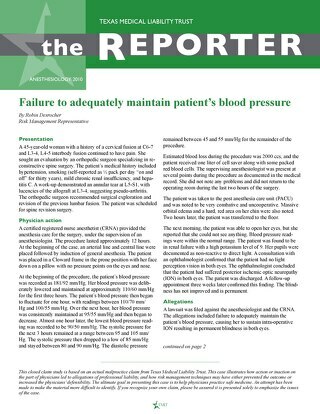 Complicating the clinical issues in this case were the actions of the anesthesiologist in altering the medical records. There are comments on the hospital copy of the anesthesia record that do not appear on the anesthesiologist's copy. The significant change to the record is the indication that the patient's head was elevated during surgery to prevent aspiration. Additionally, two sets of postoperative orders were found. 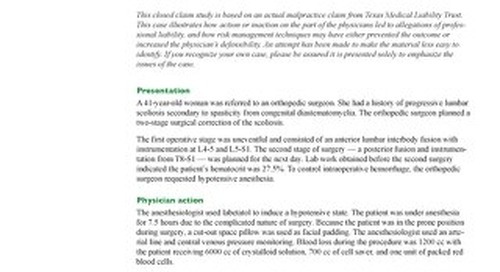 This case was settled with the consent of the anesthesiologist. The inability of the defense to find supportive expert testimony and the records alterations led to the decision to settle this case. Three issues in this closed claim are relevant for comment. One of the physician reviewers commented regarding the defendant's change of anesthesia preference based on the wishes of the son. It is risky for a physician to alter medical decisions at the request of family members without compelling evidence to do so. Would endotracheal intubation have changed the outcome? Records are to be completed contemporaneously and thoroughly to reflect accuracy in the care given. Late entries in a record can be identified, and if not labeled as a late entry with the current date and reason for the addition, will reflect negatively on the physician. 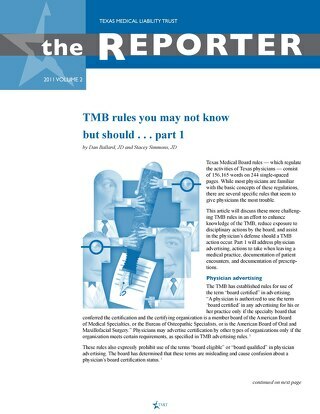 Conflict among members of the health care team becomes an avenue for a plaintiff to search for evidence of negligence and malpractice. Open communication, a willingness to listen, humility, and shared respect among the professionals involved in one patient's care may enhance patient safety and reduce medical errors.